The latest installment of Mission: Impossible franchise seems determined to impress right from the first minute. As the well-known images of Tom Cruise hanging from an ascending cargo plane appear on the screen, along with a visceral feeling of anxiety (the director Christopher McQuarrie knows his action sequences), the audience is left to witness a film flawlessly made for the 5-second attention span generation. As the story progresses, there is no time to slow down the action or take a break. The thriller and action modules just come one after another, linked together by a vague plot about a terrorist organization wanting to change the world for the better by killing important people and blowing things up. Tom Cruise as Ethan Hunt runs around once more, looking fit and stylish, strangely untouched by over 20 years since the first Mission: Impossible films both in stature and the way he presents his character. 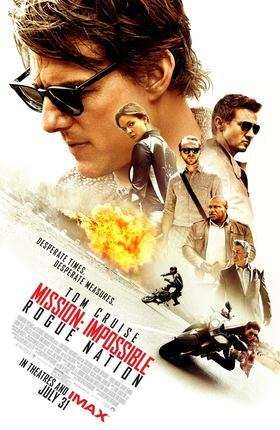 In the subsequent 2 hours of Mission: Impossible - Rogue Nation, several fantastic segments take place, covering everything from suicide bike chases to suicide breath-diving hacking intrusions. It seems to me that McQuarrie deliberately targeted that physical sense of danger threatening Ethan Hunt, determined to make the same feeling the main connection line to the audience. During the film, we fear that Ethan will fall from an airplane, drown in an underwater database or crash while speeding on his bike. In this sense, the film is a lot like those YouTube clips where you see Russian teenagers climbing radio antennae with a mounted GoPro camera. It�s thrilling, but really shallow, which is in the case of Mission: Impossible - Rogue Nation a completely valid choice, along with the decision to provide an unimpressive conclusion to the story, because it obviously doesn�t matter what happens in the end, as long as the beginning and middle are fun and interesting. Like McQuarrie and Cruise previous film Edge of Tomorrow, the action is great and the story is there only to provide the a setup for a string of thrill & mayhem sequences. It seems to me that the even emptier narrative of the Mission: Impossible - Rogue Nation, filled with usual, but pointless spy elements, works a lot better than an apocalyptic science fiction setting for this type of movie.